High-quality contact lenses can dramatically improve your standard of living. Finding the right ones requires the talent and experience of a highly trained professional. The optometrists and eye doctors at Parrelli Optical can help you find top-notch prescription contacts in the Somerville, MA area. Thousands of options are available, and our team will perform a thorough exam and evaluation to ensure that you’re matched up with the best one. When it comes to prescription contacts, you can’t do better. People often assume that the same prescription that’s used for glasses can be used for contacts, but that isn’t always true. Contacts sit directly on the eyes, so different strengths may be necessary. Furthermore, there’s more to selecting the correct pair of contacts than determining the ideal strength. They need to fit properly to ensure optimal comfort, and options like single or bifocal contacts, soft contacts, hard contacts and gas-permeable contacts all need to be considered. Parrelli Optical is the ideal choice for prescription contacts in the Somerville, MA area because we thoroughly consider all of the options to ensure the best results for our patients. • Topographical Assessment – A highly skilled optometrist will assess the shape of your globe to ensure the most comfortable and effective fit. • Corneal Evaluation – Using a biomicroscope, an eye doctor will thoroughly inspect your cornea. This information will be used to zero in on the correct pair of prescription contacts. • Prescription Strength – Your contacts should make your vision as clear and crisp as possible. 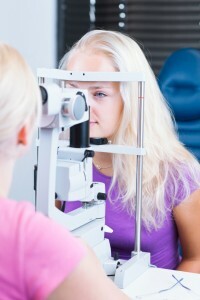 An optometrist will use an autorefractor to determine the correct strength. • Lifestyle Assessment – When and where will you wear your contacts? This information will be used to determine which contacts are right for you. You shouldn’t trust your vision to just anyone. Parrelli Optical has many years of experience, and our office is staffed by extensively trained, exceptionally talented eye doctors and optometrists. Call today to schedule an exam and order prescription contacts in the Somerville area.